This article is a short summary of Hey! Pikmin. Pikipedia features a more in-depth article. Hey! Pikmin is a 2D platforming title and spin-off entry in the Pikmin series, developed for Nintendo 3DS and released in July 2017. The game is the first handheld title in the series. The game was released with a Pikmin amiibo figure. Captain Olimar has crashed on an unknown planet inhabited by Pikmin! And his first 2D platformer will give you a new perspective on his adorably fierce partners. Touch the screen to throw Pikmin into action: swim with Blue Pikmin, fly with Winged Pikmin, and more to survive hostile wildlife, solve ecological puzzles, and escape! The game is a 2D side-scrolling action game in which players control Captain Olimar with a squad of Pikmin. Action primarily happens on the touch screen, and players can tap on the screen to throw Pikmin to that location. 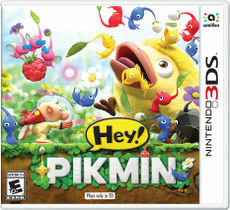 Like in the Pikmin games, Pikmin will carry and push objects to solve puzzles, find collectables, and attack creatures. The various Pikmin types (red, blue, and yellow) also retain their strengths and weaknesses from the main titles. On the top screen is the HUD, which shows collectables, and Olimar's health bar. On the bottom screen is the whistle button, which acts like the whistle in the Pikmin games. This game does not support stereoscopic 3D. ↑ 1.0 1.1 HEY! PIKMIN on the Australian Classification website. Retrieved April 18, 2017. ↑ 2.0 2.1 2.2 2.3 Nintendo Direct 4.12.2017. Nintendo (YouTube; April 12, 2017). Retrieved April 12, 2017. ↑ "Captain Olimar is back in Hey! Pikmin, landing on the Nintendo #3DS family of systems July 29." Nintendo AU NZ on Twitter (April 12, 2017). Retrieved April 12, 2017. This page was last edited on 6 August 2017, at 02:40.